IB Psychology Notes - The sociocultural level of analysis: General learning outcomes - Discuss how and why particular research methods are used at the sociocultural level of analysis. Discuss how and why particular research methods are used at the sociocultural level of analysis. This essay will attempt to offer a balanced review of how and why particular research methods are used at the sociocultural level of analysis (SCLA). The sociocultural level of analysis (SCLA) is the scientific study of how people"s thoughts, feelings and thus behaviours are influenced by actual, implied or imagined presence of others and the environment around them. Or simply – the study of how society and culture can affect behaviour. - The researcher/s sees what they are looking for, in which the expectations of the researcher consciously or unconsciously affect the findings of the study. - The participant/s act differently or accordingly due to the consciousness of being observed by people (researchers), which may influence the nature of the study. In sociocultural psychology, testable theories, and assumptions of a human"s social self and how we come to communicate and interact with the environment are observed through the social environment, which, unlike in the BLA and CLA, can be undergone. These ideas are tested and observed using research methods such as experiments, case studies, correlational studies, and interviews to focus on groups and individuals, in order to collect to develop and or support a theory. At the SCLA the main research methods used are experiments, observations, interviews, and questionnaires. These will be further analysed in the body of the essay, looking at studies and how and why these research methods are used. The research methods that will be discussed in the following essay will be experiments and observations. These will be further analysed in the body of the essay, looking at examples and the strengths and limitations of these research methods. In sociocultural research, the goal is to see how people interact with each other. Though experiments are sometimes used, the majority of research today is more qualitative in nature. 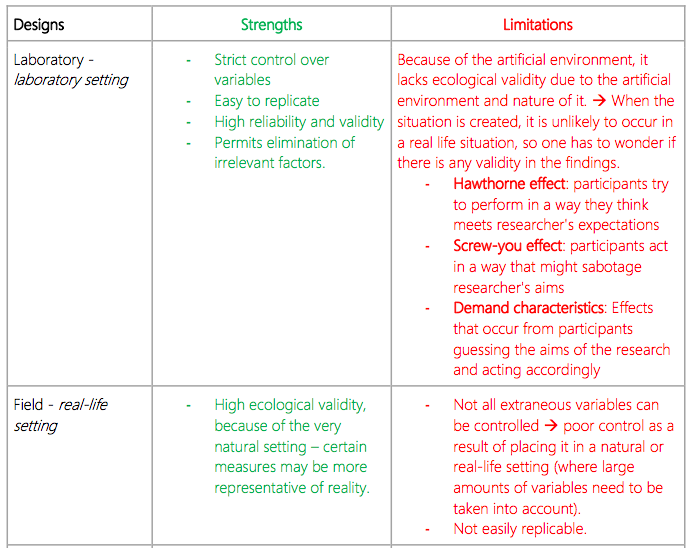 It is important that the behaviour of the participants is as realistic as possible, to avoid studies that lack ecological validity. Therefore, a significant amount of research is naturalistic – that is, “as it really is.” Much of the research is done in the environments in which the behaviour is most likely to take place. Early research mostly carried out laboratory experiments, because that was considered to be the most scientific way of obtaining data. IV: The autokinetic effect – the distance of how far a light beam "appeared" to move in a dark room --> therefore, changing the amount of people to represent a group sample to test the level of conformity in the group, in relation to their estimated answers. DV: Their estimate on how far the light moved (except for the fact that the light didn't really move which is an issue, because how can you test conformity to something that doesn't actually happen). But really Sheriff was testing the level of conformity within a group, not the actual estimate of how far people think the light had moved (the autokinetic effect). The conformity was based on if the individuals conformed to the more similar answers within a group, if their estimate had a large difference. Cause: The group situation formed when Sheriff brought the participants together to tell the answer in front of the group. Effect: Level of conformity between the individuals in the group (How many people conformed to the answer which was the most popular, from their first or original guess). This would not be able to be able to be found as effectively with other research methods such as a survey or case study, as experiments are the most suitable type to use for this particular study. Introduce: An example of an experiment in the SCLA is by Asch (1951). A: To investigate conformity in an unambiguous task. DV: The participants" line judgement (how they match up two lines of the same length); when really Asch was measuring the level of conformity between the individuals in a group situation. Cause: The group situation formed when Asch asked the participants to tell what they thought each answer was in front of the group. This would not be able to be able to be found as effectively with other research methods such as a survey or case study, as an experiment was the most suitable type to use for this particular study. Introduce the next research method (observational studies) and relate it within the context. Like experiments, another key research method used frequently in the SCLA is participant observations. Today, social psychologists frequently attempt to “see the world through the eyes of the people being studied.” In order to do this, participant observation is often utilised. Participant observation is when researchers immerse themselves in a social setting for an extended period of time and observe people"s behaviour. Participant observations are used to observe normal behaviour of participants in their normal environments. Observations involve informal interviews, direct and indirect observation, collective discussions and participation in the life of a group, where the researcher/s decide if they want to be involved in the life of the person they are observing/studying. There are two types of participant observation – covert and overt observation. Covert observation –participants are not informed that they are being observed. Overt observation –participants know they are being observed. It can provide new insights and direction for research. Participant observations can provide a rich source of qualitative data, including detailed conversations and descriptions of participant"s feelings. Covert participant observations allow researchers to study a group that may be hostile or dishonest to an outsider observing their behaviour. Observer bias - the researcher"s own belief, values, and thoughts affect their interpretation of behaviour. Observer effects - the presence of the observer affects the behaviour of participants. Sample sizes are usually small because a researcher can only be in one place at one time and can only obtain in-depth research on a small number of people. Cannot be replicated due to lack of fixed procedures and interpretative skills of the researcher. Cannot be used to explain cause -effect relationships like experiments. But this may cause distress and be unethical as participants may feel paranoid, insecure, etc. Festinger et al. (1956) conducted a study called, "When Prophecy Fails" that utilized participant observation. How does it reflect a participant observation? Why was an observation technique used? Cult members were not allow to interact with non-believers To study and monitor the group"s doubt, debate and rationalisation when "nothing" had occurred. Privacy may be violated by the researcher. Aim: To investigate the MMORPG (massive multiplayer online role playing games) Ultima Online. Researchers observed player dynamics (by registering online and playing) and mining data from Ultima developers and servers. People were treating the game as if it were real life especially given that it was so realistic in a number of ways. There were a number of heavy players (30% playing >30 hours a week) who used the game as escapism. There was an interesting dynamic of young white males. Further research needs to be done as this may not be representative. Possibly should have incorporated real interaction with participants and other means of method triangulation to determine causality. Privacy was violated by the researcher. 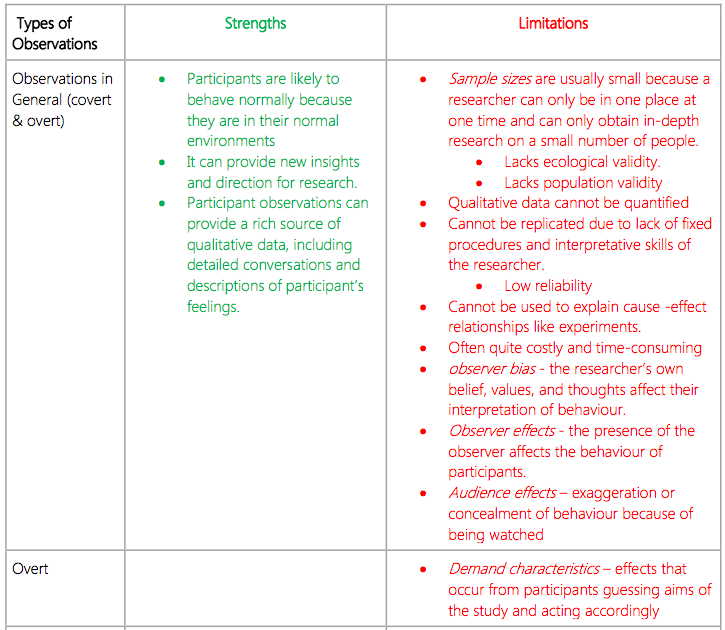 Research methods are used for collecting and analysing data. At the SCLA, the two main research methods used are experiments and observational studies. Together, they may contribute a great deal to our understanding of human behaviour.